‘Twas the day before Christmas and everything is crazypants and all I know for sure is that these are the best gingerbready thing I’ve ever laid mouth on. I’m fashionably late to the gingerbread party. I know. It’s a thing. Annnnnnd oats! And other fun (read: normal) odds and ends like molasses, oats, almond butter, ginger, and maple syrup. There’s a method in the madness!!! Why beans, you ask? Why must I turn a completely innocent treat into a beany nightmare of sorts? Because in all honesty, I was going for something similar to my beloved Gingerbread Chickpea Blondies minus the whole baking part. Who has time to bake when there’s presents to wrap and trees to decorate and cookies to stuff in your face and laundry to not do?! And then there was the whole “oops I’m out of chickpeas” thing. Black beans? Too brownie-ish. White beans? Mmmmmmm. All you need to know is that they taste like gingerbread dreams and they’re good for you, too. They’ll land you smack dab in the middle of the nice list. They’ll bring you joy and cheer and gum drops and a Vitamix wrapped in a big red bow. They’ll bring you nine more days of seventy-two degree Ohio weather sans the rain. Perhaps you should leave these out for Santa this year. If he doesn’t like them, I swear the reindeer will. Merry Christmas and to all a good bite! 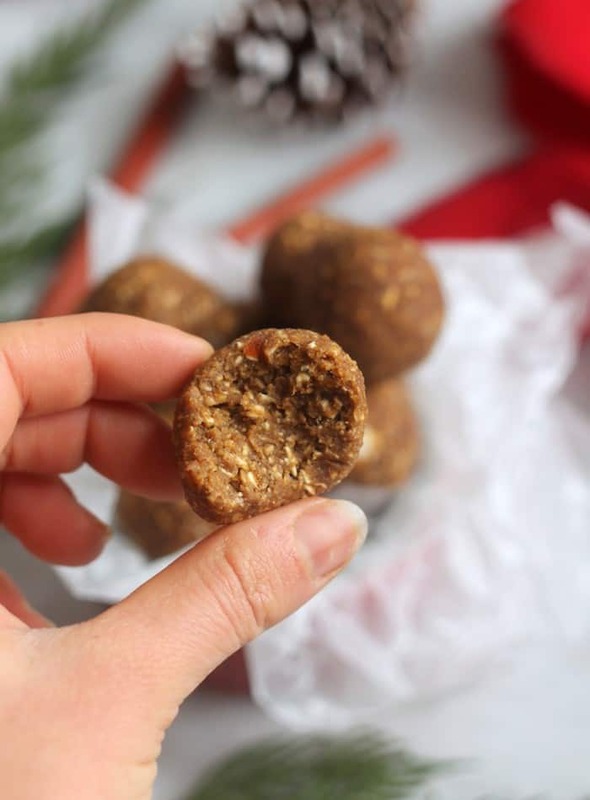 These high-fiber gingerbread bites are free of refined sugar and gluten–the perfect healthy holiday treat with a secret ingredient–beans! Place beans, dates, almond butter, molasses, maple syrup, salt, cloves, nutmeg, and ginger in the bowl of a food processor. Blend until well-combined, scraping down the sides. Add oats and blend until mixtures form a mushy dough ball. Dump mixture into a bowl. Freeze for 30 minutes. Remove mixture from freezer. Roll into balls. Keep frozen for best texture! These can be refrigerated, but they’ll be softer. If these should be kept frozen, how do you suggest we leave them out for Santa – or take them to a carry-in dinner? This sounds like a good recipe for me to try since my wife is not a fan of ginger and I can have my ginger in smaller portions. …..and no one has to know there are beans involved here. i have been feeding my boyfriend fudge studded with walnuts he doesnt know its actually tofu and honey rather than condensed milk unless he read my most recent post, which i doubt). 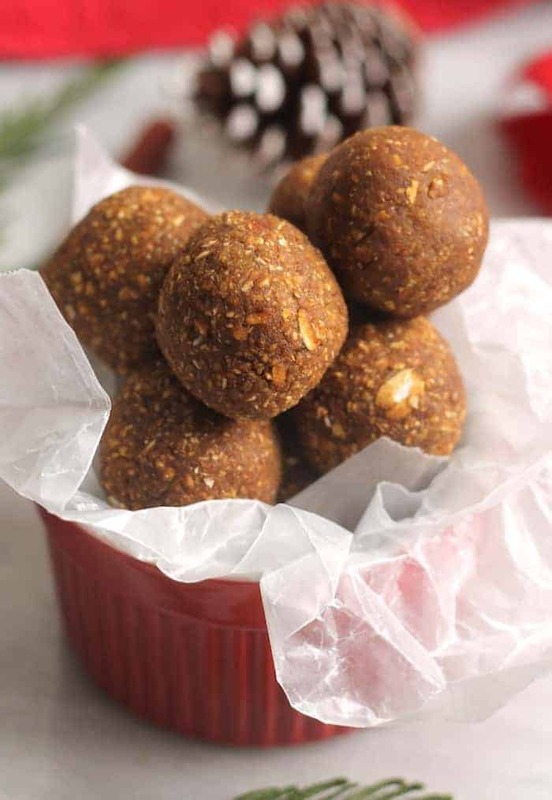 i need to try this ASAP because i have not made anything gingerbread this year,.gasp. happy holidays!!!! In my book, beans are good for errrrrything. And you had me at gingerbread so basically I’m face planting my screen right now. Can I make gingerbread all year long? Did you drain the beans? I’m using cannellini cooked in the pc and wondering if I need to add any liquid to the recipe? 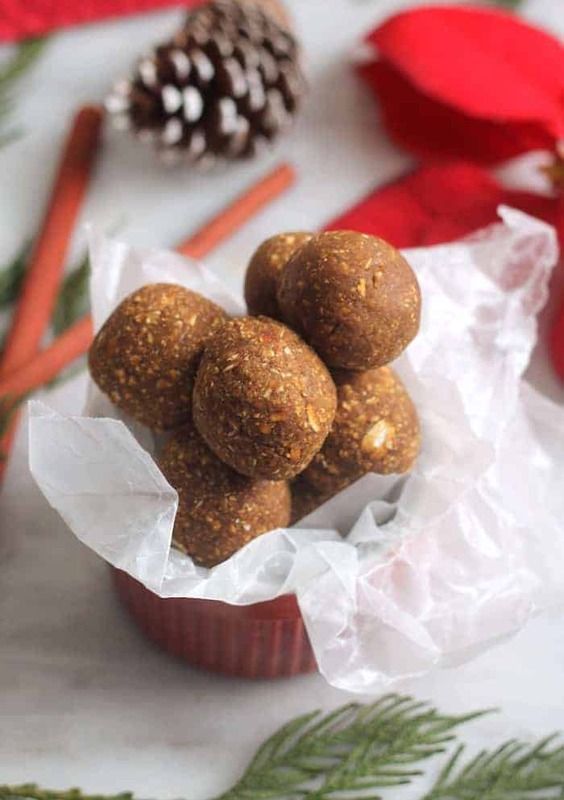 I’m on such a gingerbread kick these days and these gingerbread bites look so good! (I’ve been experimenting with gingerbread men, gingerbread muffins, and gingerbread donuts.) I love the idea of a gingerbread energy bite too..can’t wait to try it out!